Nobody has to be a Hot Man of Children's Literature. If the honor offends you, please inform me and you will be removed forthwith. It's not like I'm getting paid for this stuff. No man has ever appeared on the list that I do not actually consider to be hot. There are different levels of attraction at work here. You have your Kadir Nelsons and your Chris Raschkas and just because these fellows embody different kinds of male hotness, this does not mean that I value one over another. No man has ever been elected as a joke at his expense. Moreover, if I've never seen you in person then I'm probably taking your hotness on faith from some of your fans. Intelligence, talent, and sheer charm go a long way in this business. If you would like to be removed from the list but have no qualms electing someone in your place, feel free to do so. The standards at Fuse #8 are shaky at best. Too bad we don't know who this reluctant hottie is, so we could shower him with accolades to his hotness....but I think you stated it well. oh no...this isn't about me, is it? Dear Madame Fuse, to be included on the Hot Man list is honor in the extreme. Please refer to private e-mail. I think I know who this reluctant hottie is, and he shouldn't be offended. 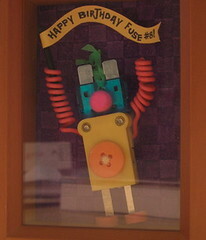 The Hot Men of Children's Literature is an honor; I never read it as Fuse making a joke at anyone's expense. I want you to start a Hot Women of Children's Literature, for equal opportunity's sake. I'd like to nominate Christopher Myers, based on a meeting 10 years ago. Also, I vote for No "hot women of children's literature." It would be akin to a "hot women of librarianship" list. Most of us are hot, anyway. I like Chris Barton's suggestion. The call for Hot Women of Children's Literature has come up in the past but it's tripping into tricky territory. Taking into account the whole "objectification of women" thing alongside the fact that I'm not entirely certain that I could judge such a competition fairly means that I am not the one for such a list. However, if anyone else wants to take a crack at one they have my blessing. And I want to be featured on it. No kidding. I'm hot as hell, babies. I've officially over-analyzed this, but I guess I vote that the men's list is objectification, too, if the same list can't be created for women. Don't let the mob lynch me, please. Yes, it is definitely objectification. But there's not much history behind the female objectification of males. And if there is no history there is far less of a problem. Or is that just a bit too much self-justification? Put another way, if a male librarian made a list of the Hot Women of Children's Literature, would it be funny or icky? I'd like to nominate David Levithan! He's totally hot and sensitive and deep. He is an awesome writer, plus he's an editorial director at Scholastic, PLUS he used to edit the freaking Babysitter's Club! How much more street cred do you need than that! Easy on the eyes, too. I second the David Levithan nomination. I would also like to nominate Eric Drachmann, author of the recent picture book A Frog Thing. I nearly swooned when he came into the bookstore where I work to do a reading & signing last month! Hey, Man. Everybody's Gotta Make A Living.